KIEV, Ukraine -- Although the raging fighting and heated rhetoric in eastern Ukraine still command the headlines, the dispute between Kiev and Moscow over Crimea simmers on and seems as intractable as ever. Crimean residents watch a TV broadcast with Russian President Vladimir Putin after the peninsula was annexed by Moscow earlier this year. Russia annexed the Ukrainian Black Sea peninsula in March, a move that Ukraine and most of the rest of the world have refused to acknowledge. Speaking on Ukrainian television on August 1, President Petro Poroshenko said his country "will not give up Crimea." "Ukraine will use all methods that are at its disposal to defend its national interests," he said, announcing his order that the Justice Ministry pursue all legal avenues. Poroshenko's deputy chief of staff, Valeriy Chaliy, repeated the position the same day, saying there is "no chance" Kiev will ever recognize the "occupation of Crimea." "Crimea was, is, and always will be part of Ukraine," he said. The tough talk from Kiev came just days after an equally categorical statement from Russian Foreign Minister Sergei Lavrov. "Crimea is part of Russia," he said. "There haven't been any talks with anybody about Crimea. There are no talks, and there can be no talks." Ukrainian Special Ambassador Andriy Veselovskiy says legal mechanisms for achieving Kiev's goals do exist. In conversation with RFE/RL's Ukraine Service, he cites as precedents the return of the Rhineland to Germany some 20 years after World War I and the return of Hong Kong to China after more than 100 years of British rule in 1997. "There are many examples," he says. "But in all of them there is one important condition -- both sides agreed to an arbitrational consideration of the situation. In the current case, I don't know anyone who can imagine that Russia would agree to participate in such a process. And that is the problem -- not a lack of mechanisms." Crimean political observer Oleksandr Starisha urges Kiev to apply to the International Court of Arbitration in Stockholm immediately. "We need to create a road map for the reannexation of Crimea based on the international agreements and laws that existed at the moment of annexation," he says. "We should already have begun with filing cases with the Stockholm court regarding the 'nationalization' of Ukrainian state property by the occupiers." But Kiev has been sluggish in devising its strategy for recovering the peninsula as it wrestles with unrest in the east and political uncertainty in the capital. "At present the structure of the government and the selection of people do not correspond to the scope of the tasks that must be carried out now," says parliamentarian Andriy Senchenko. "I'm not saying that no one is on the job and no one is working. But Crimea is occupied. There is an antiterrorism operation going on. There are huge problems in the economy. The executive branch must be set up to cope with the tasks that face us now." Ihor Semivolos, director of the Institute of Near Eastern Studies in Kiev, told RFE/RL that the campaign against pro-Russian separatists and mercenaries in eastern Ukraine is preventing the government and its analytical structures from focusing on the difficult issue of Crimea. 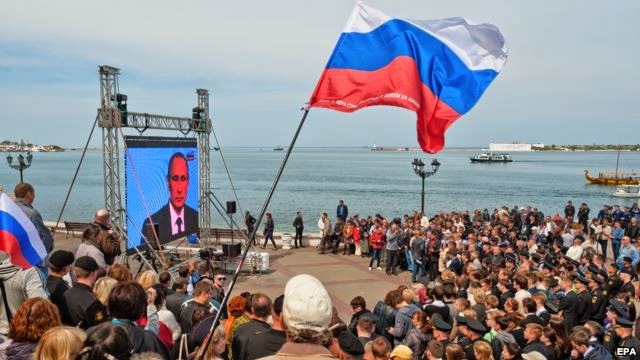 "It must be understood that such a complex problem as the return of Crimea will demand a whole complex of actions in many different areas," he said. "To be honest, I don't believe that Crimea can be returned through courts or legal means," he added. "But this doesn't mean we shouldn't try. This must be done -- we must have all the arguments and all the court rulings. We must go through every procedure in order to eventually get Crimea back. But I think it will take a combined approach -- there will be an element of force, a political element, and a legal one." Andriy Klimenko, editor of the website Black Sea News, says the failure of the separatist movement in eastern Ukraine could be the key to returning Crimea to Ukraine. "When [Russian President Vladimir] Putin was unable to realize his plan to create a land bridge from Donbas to the Azov Sea, it was a disaster for them," Klimenko argues. "It is the fundamental, scientific basis for the return of Crimea -- the relatively quick return. Crimea is cut off from the mainland -- it is a geoeconomic island and this is the root of the problems of supplying the region with its needs through existing lines of communications." Black Sea News tracks international aircraft and ships that come to Crimea in violation of international law with the goal of pressing for sanctions against the companies involved. Russian political consultant Stanislav Belkovsky says Ukraine will have to focus on the long term. "Of course, Vladimir Putin is never going to give Crimea back," Belkovsky told RFE/RL. "As long as he remains in power, there is no point in even thinking about that. But even if Vladimir Putin leaves power, the Russian people are unlikely to agree to a loss of territory. Most likely, we should be thinking about giving Crimea the status of an independent country, rather than returning as part of Ukraine." But any strategy with a chance of success, Belkovsky says, depends on Kiev creating conditions in Ukraine that would make the majority of Crimeans want to return if the moment arrives. Situation with gas supplies for public in Ukraine is alarming. Quote: "Почему человек должен сидеть немытым, если виновато правительство или местная власть, которая не перечислила средства за бюджетные организации? Для того, чтобы появилась горячая вода, нужно решить эту ситуацию. Когда погасят долги перед «Киевэнерго», оно рассчитается с НАК «Нафтогаз Украина». Но и там все тоже очень непрозрачно, потому что тарифы у нас устанавливаются по затратному принципу. То есть чем больше потерь у предприятия, тем ему лучше. Оно все это закладывает в тариф. И оно не заинтересовано снижать себестоимость своей продукции», – подчеркнул он." Quote: “Также, по его словам, государство не создало привлекательный инвестиционный климат и условия для освоения инвестиционных средств, предоставленных Украине международным сообществом для достижения сдвигов в сфере энергосбережения. If those facts in the quote are correct and no immediate action taken by Ukrainian Government to fix the gas rates origination, which may become not only an embarrassing for the government but may bring people back on the streets.